Tickets To Excite Your Life! Opened in 1996 at a cost of $144 million dollars, Bridgestone Arena hosts concerts, hockey games, basketball games and trade shows and is probably the most popular venue in Nashville. In the past Bridgestone has hosted such noted artists as "Brooks and Dunn", "Reba McEntire", "Yanni", "Miley Cyrus" as well as many sports and religous events. Keep watching our pages as your favorite artist may be appearing here soon. Yeah!! Predators!! get in on all the action! 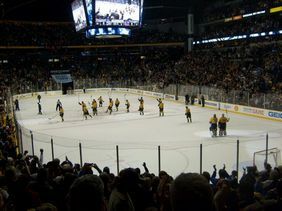 Hopefully our Nashville Predators will do it again !! Nashville Predators - Don't Miss Them! If you have never seen the Nashville Predators,,, get off the couch and go! It's something you can take the entire family to see and everyone enjoys themselves. 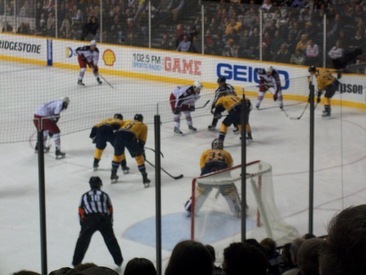 My recent visit was Predators against the Columbus Blue Jackets - needless to say A Great Game!! Nashville has this amazing talent for being such a wonderful crowd of supporters for the home team, and the Predators are no exception ... it is only something to witness then you will understand. This game was so close and so many shots came within inches till finally, in the last 15 seconds the Predators scored the winning goal. Totally into it, on the edge of your seat and the Predators delivered. There is so much going on at the game that you will truly enjoy the experience even if you are not a total hockey fan. During the intermissions and game time outs the jumbo tron shows different people from the audience cheering for the home team and that is worth the price of admission. When you go, take in a restaurant on 2nd avenue first and make a night of it. We parked in Commerce garage and had plenty of time to eat and make the game, and still see a few sights on Broadway in the mix. Get out of that chair and have some fun! See the Nashville Predators next game!! What Concert are you looking for?